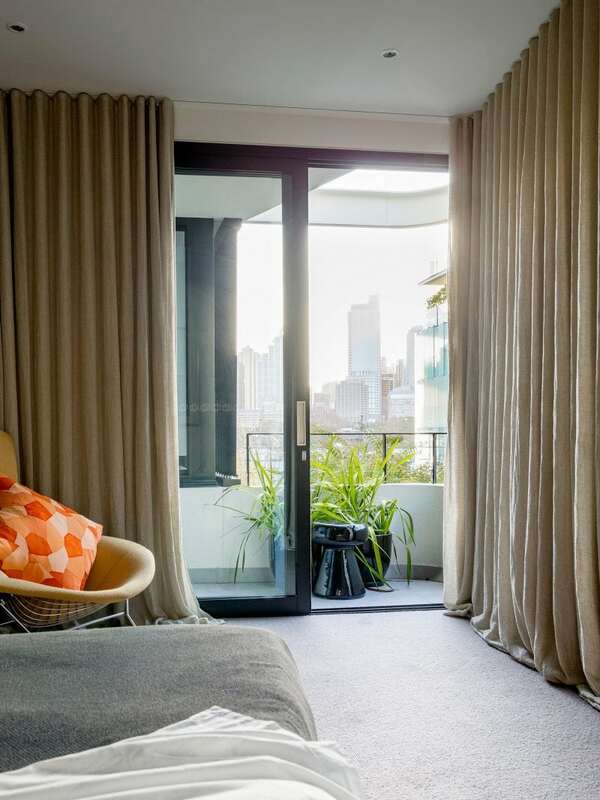 Shoulder to shoulder with other apartment buildings, the original 1920’s two-storey flats were transformed into a four storey block with a basement carpark and cellar, a ground floor garden apartment and a two-storey penthouse. The use of every millimeter has been carefully planned to condense the content of a large house into this city pad, with an eclectic collection of furniture and art; the skilful joinery design by Project Architect, Jane McNeill aimed to provide as much storage as possible for the owners, while lending elegance to the interiors in touches such as the dressing table in the dressing room. 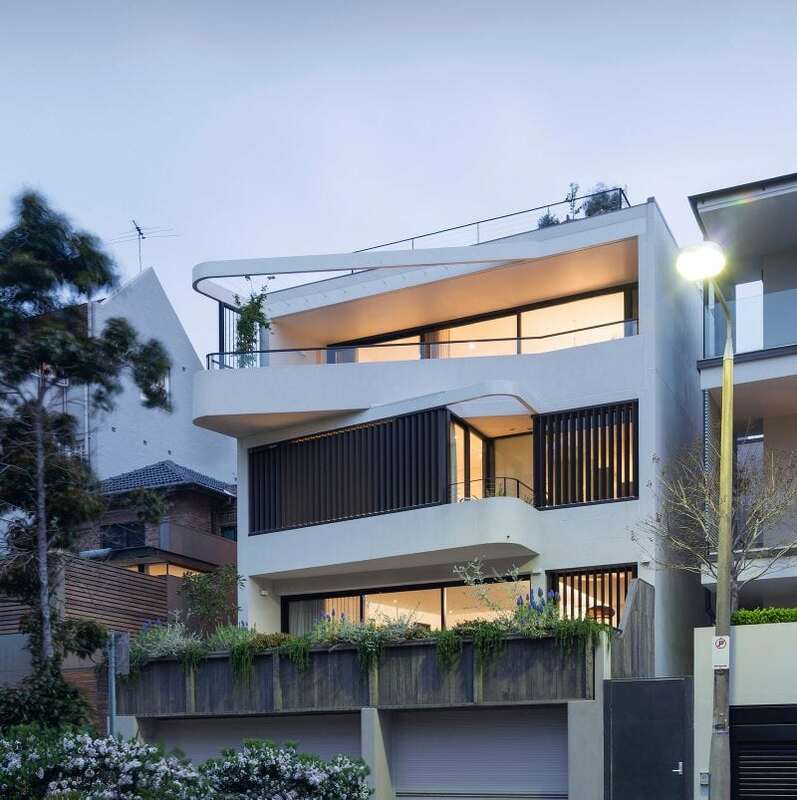 The scissor balconies of the back elevation are angled to offer side views while maintaining the building’s rear alignment with the neighbouring properties. 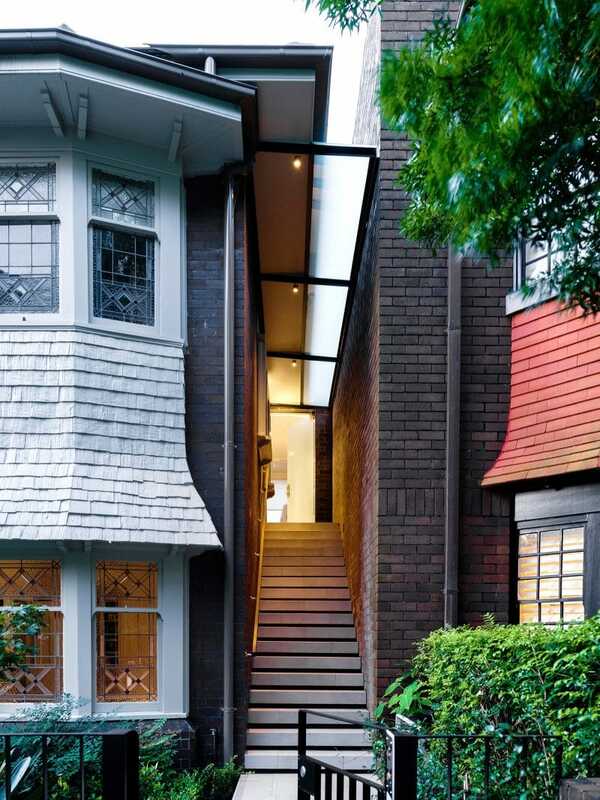 The Council thought but resisted the tempation to emacitate the elevation by cutting it back to a flat façade. Sydney City Council is a design intelligent council, a rare thing in that level of authority. 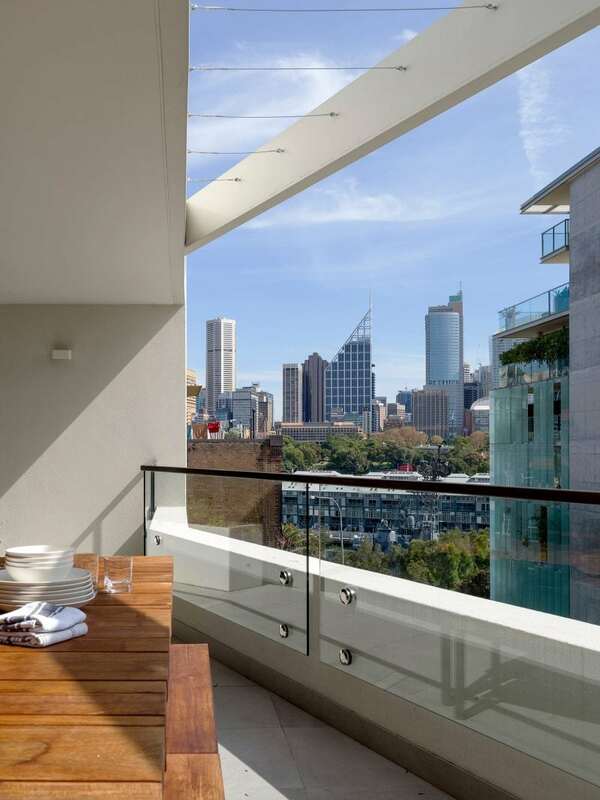 Sir Norman Foster’s unfinished tower, the Art Gallery of New South Wales awaiting their SAANA Architects additions, Woolloomooloo Wharf with the W Hotel, are part of the City views enjoyed by these Duplex apartments. “Mirror mirror… who in this realm is the fairest of them all?” Jane McNeill’s masterful joinery is hard to beat with its dark American oak timber veneers, carara marble benchtop, polished chrome framed mirror, ottoman by Eileen Grey and frosted glass wall between the dressing room and ensuite bathroom to provide defused natural light for this otherwise landlocked space. 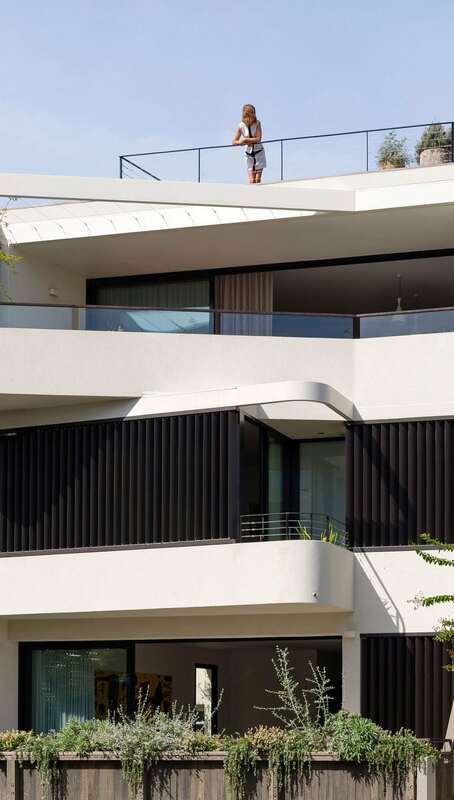 The internal stair of the penthouse needs to compete with a lift, and so provides a pleasurable and sensual ascension to the upper living spaces. 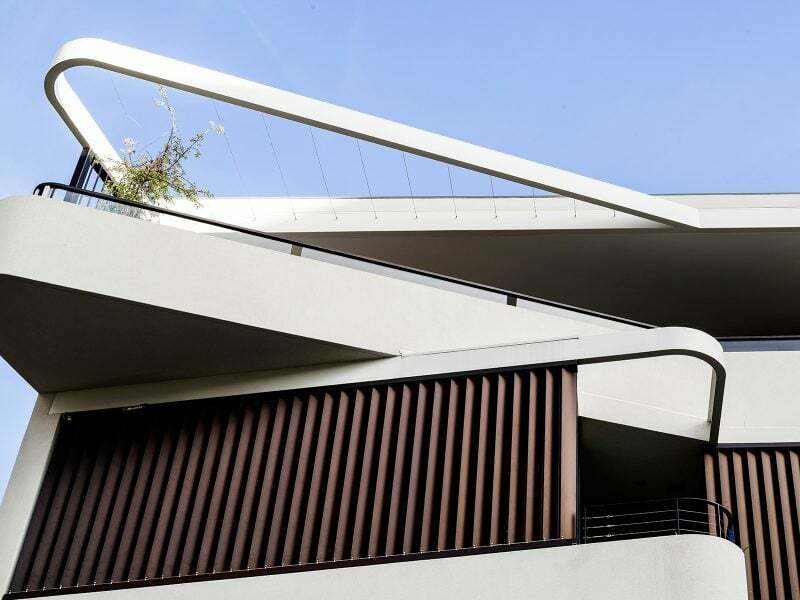 Placed between the old and new parts of the building it forms a vertical and horizontal connection. 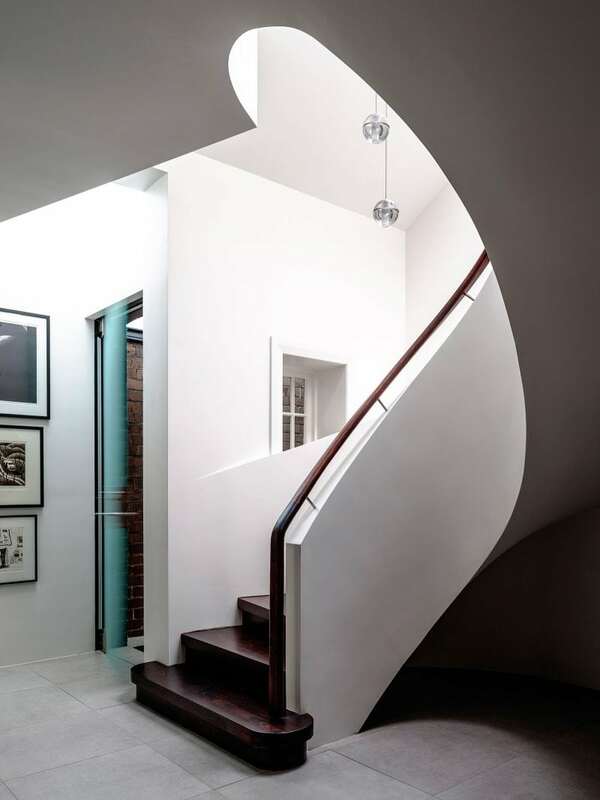 Spiral staircases have a unique characteristic in creating a rigid and self-supporting form that requires no beams or columns. 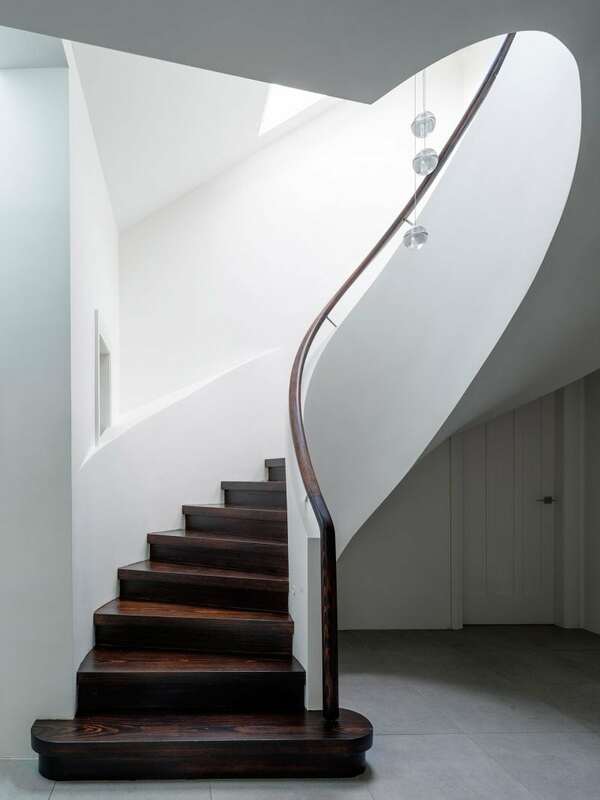 In this case the spiral plywood balustrade is a strong shape that will not distort. 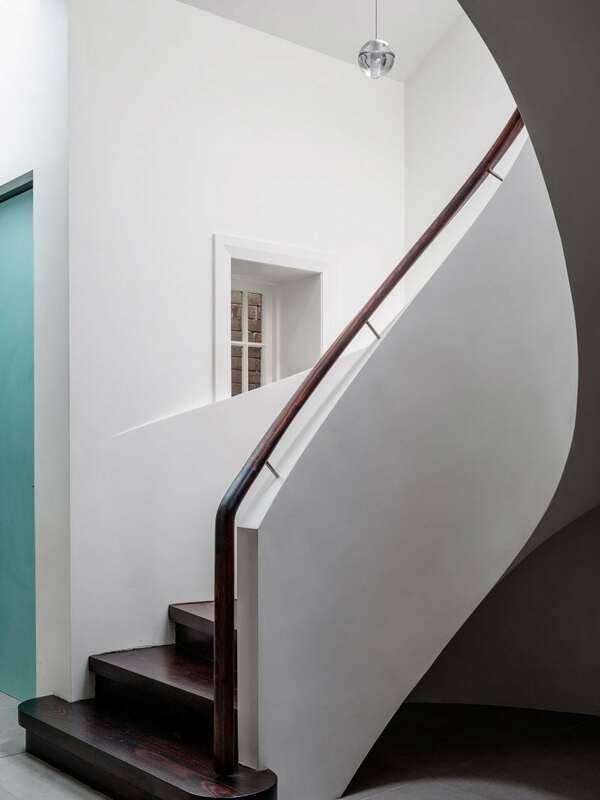 The best aspect of this stair is how the balustrade is overlaid with the original mid 1920s window, retaining its outlook and light. 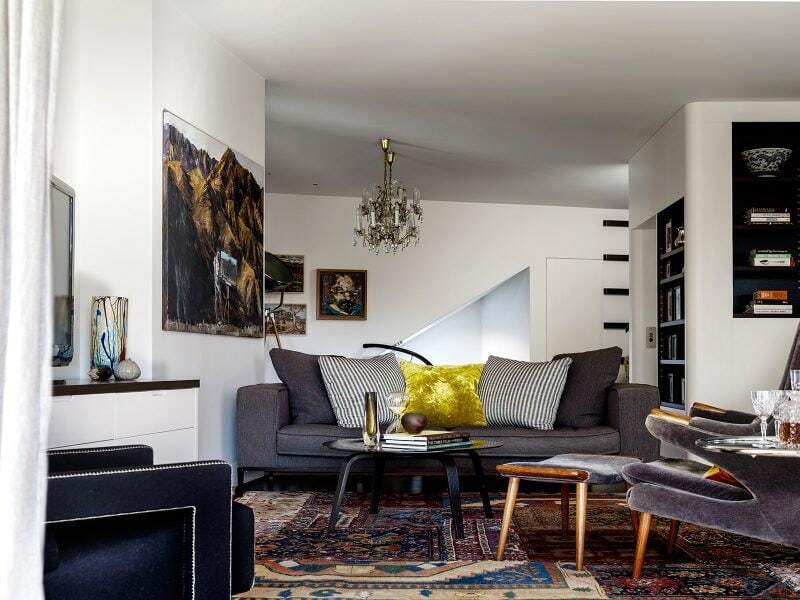 Bookcases and a television blend in amongst the owner’s collected art, including paintings by Euan McLeod and Sali Herman, and their design classic furniture pieces including a Hans J Wegner 'Papa Bear' wingback chair and ottoman. (right). 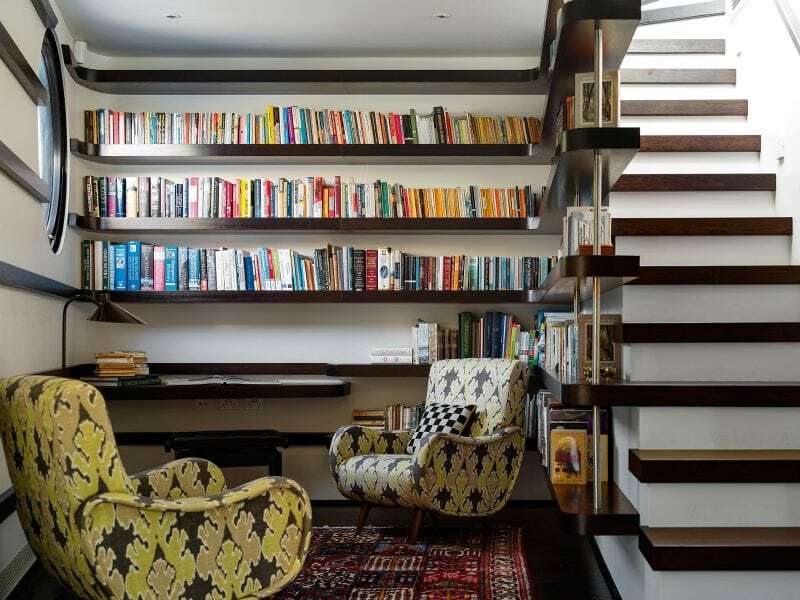 To the rear of the image the lift door can be seen, integrated into a bookshelf. A small library where one can read and contemplate the sky through a porthole window or glazed roofhatch. The stair, built on top of the kitchen pantry leads up to the roofhatch. 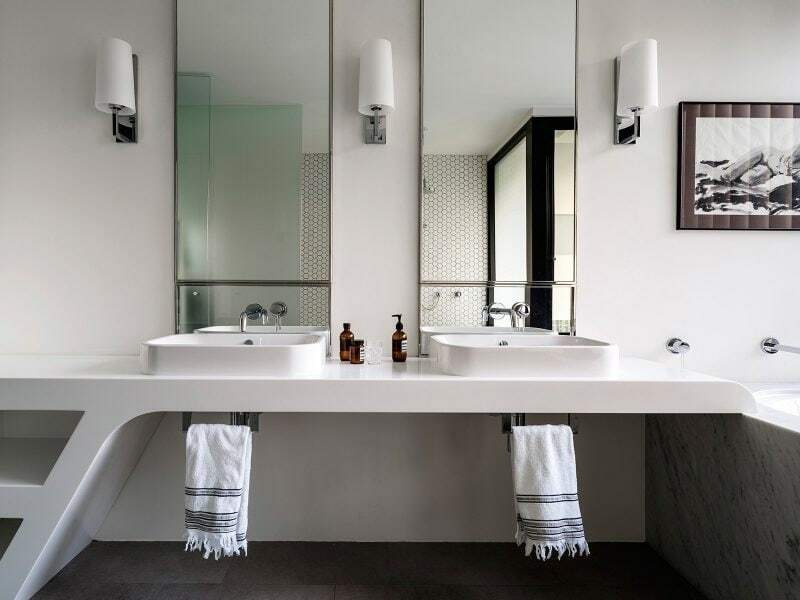 Also with city views, the master ensuite bathroom features a graphicly angular corian benchtop, Lea Ceramica tiled floor carara marble bath surround and pure untiled walls. The morning ablutions are performed in a “cabinet d’ etude”, a study like space. 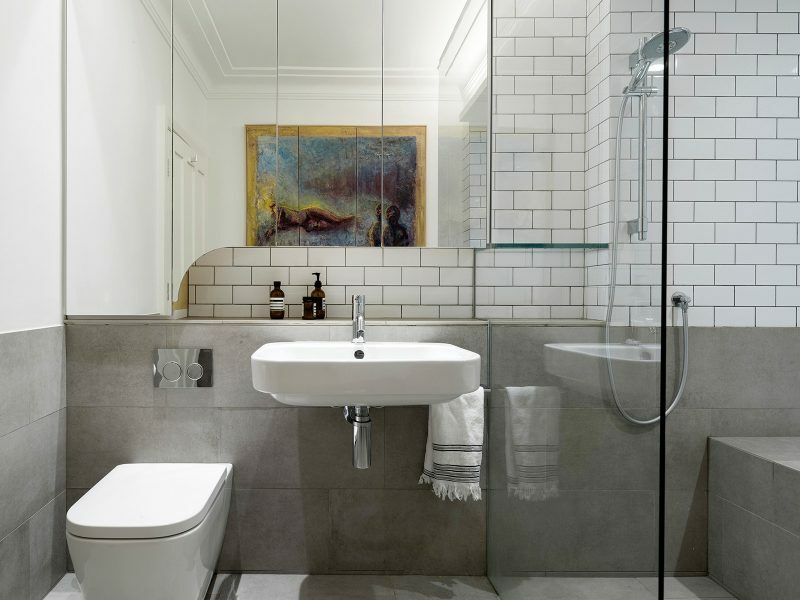 The main bathroom is located in the 1920s part of the apartment and so features metro style ceramic tiles with the exceedingly tight grout joints characteristic of the period. The original frontage of the duplex apartments, with their shingle skirted bow windows and a new entry stair, wedged between dark liver pressed bricks.